Terence Rahme of Tergar Developments never set out to use NEOLITH sintered compact surfaces. Years of experience in upmarket kitchen design and manufacturing saw Terence working with traditional kitchen surfaces such as engineered stone, granite, glass and high gloss cabinetry until NEOLITH came across his path. “It all started when a client wanted a thin, floating countertop rather than the usual engineered stone top thicknesses after seeing designs from Europe. I started designing around her request, researching what was in the market and that’s when I discovered NEOLITH,” says Terence. Terence has a history of working with glass as a kitchen manufacturer and says that he’s found handling NEOLITH exactly like glass works perfectly. What happened next in his NEOLITH kitchen installation seemed to be a disaster, but came as a blessing in disguise. “There were severe problems with the initial cutting and cladding of the NEOLITH – there was no consistency. All the draw fronts were different sizes, there was a general lack of accurate measurements and there were problems in handling and assembly,” Terence states. That’s when he decided to try cutting NEOLITH himself. “We just haven’t ever failed before, which is why I felt confident that we could sort out the problems with the initial NEOLITH job. NEOLITH’s technical manager gave us confidence that we could get trained and effectively use the product,” says Terence. After receiving product training, Terence performed a basic test. He put a sample of NEOLITH on his machine and it cut perfectly. After some market research, a machine dedicated to cutting NEOLITH’s sintered compact surfaces was purchased for the factory. “What I love about Terence’s story is that it perfectly showcases what we’re trying to show the industry – that NEOLITH is an incredible product that will offer fabricators new lines of business and designers new possibilities,” says Gavin. Terence saw the modern kitchen design style change a few years ago with the light floating countertop look, and says he’s been designing around the lightweight products for a while and waiting for a product like NEOLITH. Terence and his team conceptualized this kitchen design. They wanted to create a minimalist design with a holistic look and feel and pitched the idea of a uniform look to the client who loved it. This kitchen is the in the top three finalists for the international Blum competition. Every 3 years Blum run a competition – the winner gets exposure internationally for the next 3 years. 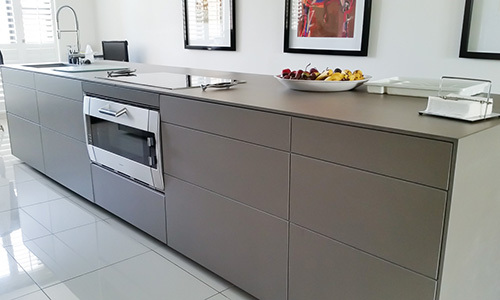 Terence’s NEOLITH kitchen features a Cement 12mm countertop and matching finishing panels and 6mm doors and drawers. 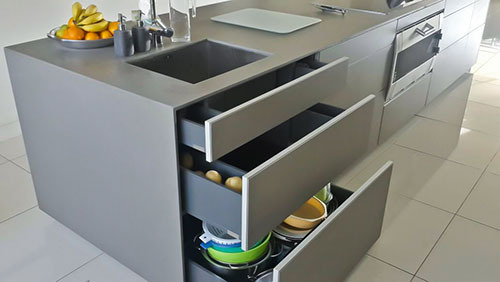 All the drawers and aventos units have Servo-drive Blum technology. The fridge and freezer are push-touch with automatic close, and this is the first one installed in the world! 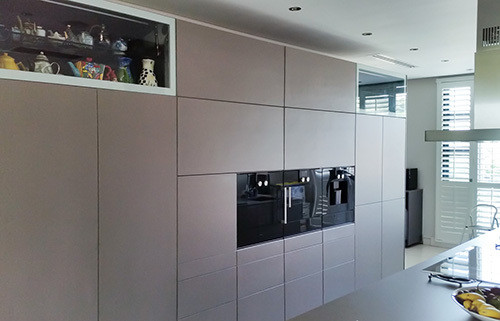 “We managed to do full-size larder unit doors clad with NEOLITH, which is unusual because it’s normally too heavy to clad in stone and still have the mechanics function properly,” says Terence. What would Terence say to people who have given up on NEOLITH? I think the market is heading in NEOLITH’s direction – if fabricators and designers just take a bit of time and have a bit of patience with it, they can really get it right. If I can get it right and I’m new in the stone trade, I’m sure anyone can get the best out of NEOLITH. NEOLITH is far more than a kitchen countertop product. Wall cladding, showers, flooring, ethanol fireplaces… All of a sudden we can do a full slab shower and now we can stop mold growing and have a spectacular design result too. People mustn’t get the idea that it’s a kitchen product. Your manufacturers need to understand this, that NEOLITH provides more business opportunities because of its versatility in application.